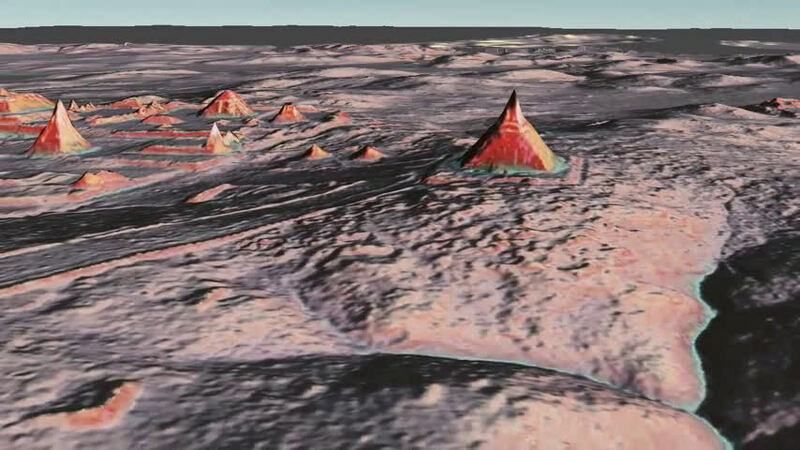 A consortium of 18 scholars from U.S., Europe and Guatemalan institutions including the Ministry of Culture and Sports were enabled by the Fundación PACUNAM (Mayan Heritage and Nature Foundation) to analyze lidar data covering over 2,100 square kilometers of the Maya Biosphere Reserve. 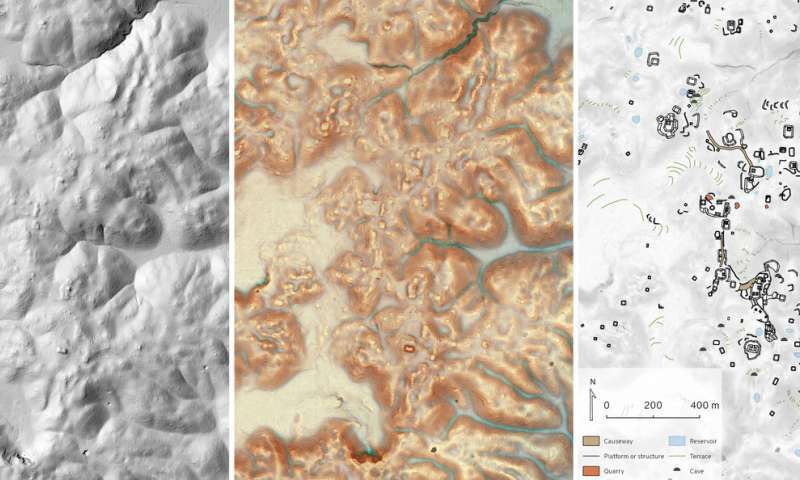 "Since LiDAR technology is able to pierce through thick forest canopy and map features on the earth's surface, it can be used to produce ground maps that enable us to identify human-made features on the ground, such as walls, roads or buildings," Canuto said. 61,480 ancient structures in the survey region, resulting in an estimated population of 7 to 11 million at height of the Late Classic period (650-800 CE). The structures include isolated houses, large palaces, ceremonial centers and pyramids. 362 square kilometers of terraces or otherwise modified agricultural terrain and another 952 square kilometers of viable farmland, demonstrating a landscape heavily modified for the intensive agriculture necessary to sustainably support massive populations for many centuries. 106 square kilometers of causeways within and between urban centers and numerous, sizeable defensive earthworks. 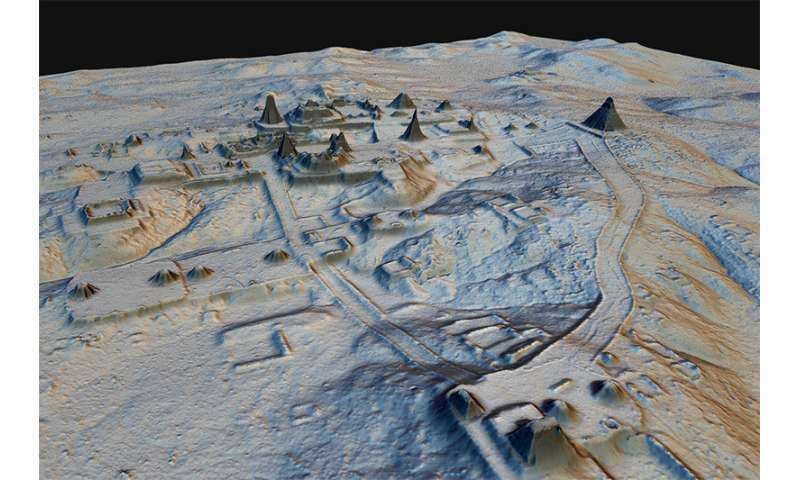 This substantial infrastructure investment highlights the interconnectivity of cities and hinterlands as well as the scale of Maya warfare. "Seen as a whole, terraces and irrigation channels, reservoirs, fortifications and causeways reveal an astonishing amount of land modification done by the Maya over their entire landscape on a scale previously unimaginable," Estrada-Belli said. The article http://science.sc...eaau0137 is behind a paywall. The video zooms out from a location approximately https://www.googl...!5m1!1e4 in Parque Nacional Tikal. I have a hypothesis. Maybe these people were building pyramids and high buildings so they could find their cities in the jungle from a large distance. 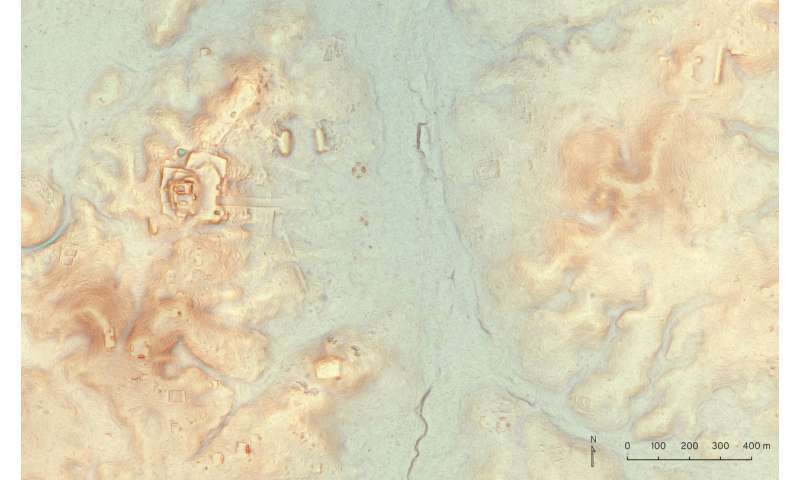 The article http://science.sc...eaau0137 in Parque Nacional Tikal. More evidence of the extreme danger these cultures posed to euro civilization. Their cities were bigger, their armies larger, and they had advanced knowledge of chemistry and metallurgy. Had they gotten hold of euro tech in gunpowder and ocean navigation it would have been them doing the invading. And they had the precious metals and drugs to buy this tech from independent traders. Had these commodities found their way eastward they would have destroyed euro culture and collapsed its economic system. And so a campaign was conceived. Europe developed the weapons to destroy these cultures and the ships to get there. Martial law enveloped the subcontinent for several gens and venturing into the atlantic was deemed a great heresy. And at the proper time the invasion was launched. Columbus established the first bridgehead by traveling along the african coast and turning west at exactly the proper latitude to take him into the Carribean. Islands were cleared for staging. Of the 10k Mayan books originally found, only 3 remain. The rest were destroyed by the church. The history of this whole campaign was intentionally obliterated and replaced by nonsense. Remember when the Inca were considered peaceful colorful people? And then they found all the ritual sacrifice. To understand what happened we need to analyze this crime scene forensically. We need to ascertain motive, means, and opportunity. Egyptians, phoenicians, and others traded with the American civilizations. Vikings were in the Caribbean. So euros had to know all about them, including the extreme dangers dangers they posed. And it is not unreasonable to assume that priestly euro emissaries made early contact with the intent of neutralizing this threat. So were euros. So were everybody else, everywhere, always. And overpopulation us always the cause. The question is, was this conflict constructive or destructive? The idea that history is all happenstance and that our civilization has survived by mere chance, is also nonsense. What we do know is that order was repeatedly established throughout history, only to collapse time and again from the effects of overpopulation. I think early on leaders began to accept the inevitability of conflict, and began to use it constructively to solve their overpopulation problems. They began staging these wars and predetermining the results to their mutual benefit. Greek wars among the city states were constructive. They solved mutual problems and strengthened the culture as a whole. And Aristotle was able to engineer a campaign to conquer the known world by teaching both macedonians and the persians how to wage constructive conflict and establish empire. Leaders knew that the people were their true enemies. Their numbers would always grow faster than the food supply, and soon enough they would be blaming whoever was in charge for their misery. War, revolt, ecologic destruction and collapse would always ensue. The city mounds would add another layer of ash and rubble. So leaders began to bond together to wage war against the people. They intermarried, and a tribe of Leaders emerged, dedicated to saving the earth from the people who inhabited it. "For god so loved the WORLD..." -not the people. God would promise the people absolutely anything in order to save IT from THEM. This idea and culture was an easy sell to desperate rulers everywhere. It quickly spread around the globe. And it explains the sudden rise of civilizations on all the continents, including the americas. Our Shepherds lead us into the valley of death and make us to lie down in green pastures, in heaps, in droves. Fertilizer. It's from my own great and terrible brain. It's from accepting the inevitable and realizing the obvious. "Chris Stewart is a multiple New York Times bestselling author who has published more than a dozen books, has been selected by the Book of the Month Club, and has released titles in multiple languages in six countries. He is a world-record-setting Air Force pilot (fastest nonstop flight around the world) and former president and CEO of The Shipley Group, a nationally recognized consulting and training company. Currently, he is a U.S. Congressman representing the 2nd Congressional District in Utah." -I do believe this Tribe exists, and they seem to enjoy exposing their machinations in cryptic ways. They wrote the bible after all. So I'm going to have to peruse these books and see if they're enlightening. "Utah's 2nd District Congressman. Former Air Force B-1 pilot, author, House Intelligence & Appropriations Committees." "During his time in the Air Force, Stewart set three world speed records including the fastest nonstop flight around the world [in a B-1]... Stewart was awarded the Distinguished Graduate (top of the class) designation..."
"Shipley also participates in government anti-terrorism training, corporate security and executive preparedness consulting..."
"[His book] The Miracle of Freedom: Seven Tipping Points That Saved the World became a New York Times Bestseller within two weeks of publication, and was selected for the National Communications Award by the Freedom Foundation at Valley Forge... co-written with his brother, U.S. district judge Ted Stewart. The Miracle of Freedom was endorsed by radio/talk show host Glenn Beck, and Beck's coverage is credited with the book becoming a bestseller..."
Well, the survivors get to censor the histories.